"The Great Fire was stopped at Holborn Bridge, the bridge over the Fleet, where now is Farringdon Street, and the Church of St. Andrew's, Holborn, escaped. The church, rebuilt by Wren in 1687, still contains portions of the earlier building. 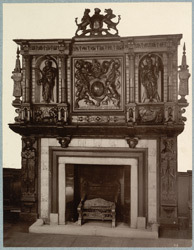 The Chimney-piece is mentioned by Allen (History of London, iii. 680), as being in the inquest room, rebuilt in 1824. The present Court-house was built in consequence of the changes made in the neighbourhood by the erection of the Holborn Viaduct, which so altered the old levels that the church is now below the street. The interior of the church, one of Wren's finest...has been ruined of late years by alterations in the worst possible taste. An incident of this mis-matching is so utterly incongruous that it has been necessary to revise the negative to the extent of removing all trace of the organ front."